The PlaneWave Instruments PW20-RC is a 20 inch (0.51 m) f/6.8 Ritchey-Chrétien (RC) Astrograph telescope. The instrument weight is 140 lbs (64 kg) and comes standard with a back plate retaining ring ready to accept the focuser of your choice. 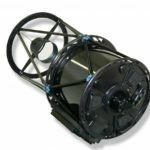 PlaneWave's CDK astrographs have become the telescopes of choice for universities, industry, and astrophotographers around the world, and now PlaneWave offers the PW-RC series to meet the custom needs of the scientific community. More about the Optical Design. The RC20 in its native format (no field flattening lenses) uses only a primary and secondary mirror with reflective coatings. This can be useful when making observations primarily on-axis and wide field imaging is not a concern. The PlaneWave RC20 is available in various types of mirror material. Standard mirror material is borosilicate. The telescope is also available in fused silica optics.